It's your worst nightmare. You're hauling down the road, coming in hot to an unfamiliar corner. Round the apex and in your way is a jumbled mess of rocks, glass, and what may very likely be fresh horse droppings. There is no way you want to run into that stuff. You grab a handful of brake lever but nothing happens. Soft, squishy, and low powered, there's no missing it now. Plowing into the mess of debris and down you go. 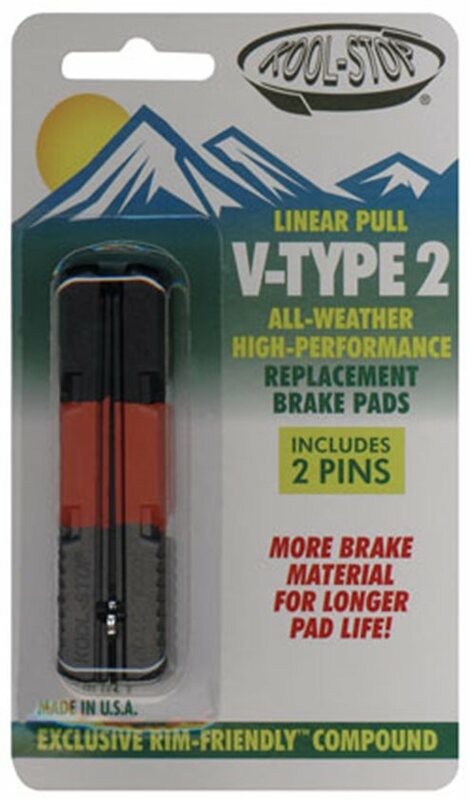 Replace those worn out pads with Kool-Stop V2 Replacement Brake Pads and next time, have the control you need to steer clear of what may lie around the bend. I installed these brakes on my rear wheel hoping to get some better stopping power and durability than the pads I had previous. I've ridden in all types of conditions, dry, snow, rain, and these brakes have held up to all. Waiting to see how long these last. Put these on my kid’s mountain bike. He seems to like them just fine and he was able to stop his bike from cascading downhill whenever he applied pressure to the lever. Replacement brake pads for the Shimano XTR / 965 , Shimano XT / 765, LX 585 and Saint M800 hydraulic disc brake system. Longer pad-life, good for anti-fade, good consistancy either wet/dry.